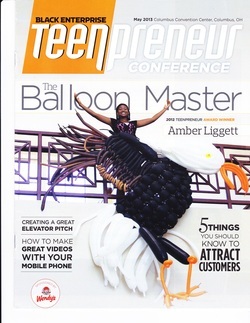 Gracing the cover of Black Enterprise Teenpreneur! "BALLOON BENDER AMBER LIGGETT STARTS OFF PUMPING AND INFLATING A SKINNY BLUE BALLOON ABOUT TWO INCHES FROM THE END, AND THEN HER FINGERS BURST INTO ACTION AS SHE PINCHES. TWISTS, TURNS, AND TUCKS IT INTO WHAT APPEARS TO BE A SNOUT AND THEN EARS. SHE THEN BRINGS IT TO LIFE BY ADDING EYES, A NOSE, AND A SMILE. THE DOG IS DONE AND HER AUDIENCE AT THE 2012 BLACK ENTERPRISE TEENPRENEUR CONFERENCE APPLAUDS AT HOW QUICKLY THE BALLOON SCULPTURE CAME TO LIFE." Click here to hear Amber's NPR interview! 2013 THE WASHINGTON POST / ROOT.COM FUTURIST! Amber is recognized as one of the "25 brightest African-American innovators 16-22 ...who use their talents to make the world a better place."